Earlier in the week I wrote about the basics of good email communication, the three Ts. In this follow-up I want to cover a few more complex things which didn't fit in the previous post, particularly around the theme of an email newsletter. Why do people unsubscribe from mailing lists and newsletters? Reasons people no longer want to receive a regular email from an organisation include, in ascending order of importance according to Litmus: Found an alternative way to get the same info, Preferred to seek out info on their own, Found the content irrelevant, Received too many emails generally, Found the content to be repetitive or boring over time. So how frequently should I email? In Part 1 of this post I talked about the importance of being Timely - emailing at the right time of the day so that your email is received both at a time when people actually read emails and when yours isn't buried under a pile of other emails coming in at the same time. 3pm appears to be the sweet spot. There's another aspect to being timely though. Firstly, Monday appears to be the best day on which to send an email newsletter - for all the reasons you'd imagine (people are still full of vim and vigour early on in the week, and not yet weighed down by all the things they wished they'd got done but ran out of time to do). Secondly, I believe it's really important NOT to email to a fixed schedule, for example the first Monday of every month. A vital aspect of good communication is not wasting opportunities by communicating when you don't need to - it reduces the value of your communication overall and edges you closer to becoming part of the white noise. So send your newsletter or other 'important updates' email only when there's a weight of useful things to say, rather than just when it's the time you usually send it. Communicate because your audience NEEDS to hear what you have to say, rather than because you need to send a monthly update. How long should my subject line be? I mentioned in Part 1 that I think the Subject Line is hugely important, and that calling your email 'Newsletter' is a recipe for being completely ignored. You need a decent title, one which gives people a specific reason to open the email; a benefit to them. As to how long this subject line should be, there is conflicting evidence about this. EmailAudience found that very short worked well, medium length worked REALLY badly, and very long (tweet length subject lines, basically) worked fantastically. However MailChimp analysed 12 billion emails and concluded 'Subject line length means absolutely nothing'! If you compare the graphs showing the two companies' findings, they do actually follow broadly the same pattern - short and long are good, medium length doesn't do much for anyone. It's just that how much of a difference this makes is clearly reflected as being much smaller by MailChimp. They conclude with this very sensible statement which makes a good point about Subject Line length and the kinds of devices and platforms your audience are reading on. How can I measure and track the impact of my email? There are elaborate things you can do with Gmail to track open-rates of emails, but I think that's much more important in traditional business than it is in non-profit comms. More important is to measure and track the impact - essentially, do people ACT on the email, and can I influence how often this happens by changing when I send the email, the subject line, the tone, the length and so on? If your email is a just general update, measuring impact is very hard to do. If, however, it includes a Call to Action, and that action has a website involved - e.g. 'Try our new online resource [link to resource]' or 'Come to our workshop [link to booking form]', it becomes possible to see how effective the email is by measuring the Engagement Rate. This is the number of clicks on the link divided by the number people who received the email - so take a really basic example, if you email 100 people and 30 click the link, the Engagement rate is 30%. How do you find out how many people click on the link? You use a unique URL created especially for the email via bit.ly. Bit.ly is a URL shortening service (useful in itself) which provides two fantastic functions for Comms purposes - it allows you to customise the URL, and it counts the number of times that specific customised URL is used. So going back to the email newsletter - if you're launching a resource or promoting an event, and you want to know how effective your email has been, use a customised bit.ly URL to see how many people clicked your link. If half the people you email click on the link you've included, that's a pretty fantastic rate of return as these things go. Build on whatever formula you used and do it again! If only 5% click, then do things differently next time - perhaps change the subject line, or make the call to action more prominent, or email at a different time of the day or week. Should I care about email preview panes? If your audience are young (University students, for example) then yes, this matters a little bit. According to ConvinceandConvert, 84% of 18-34 year olds use an email preview pane. I am 34 and I do this! I have a preview pane in both Outlook and Gmail for work, where I can - but not in Yahoo for my personal email, where I've never worked out how. I much prefer a preview. This means these users will see the first few lines of the email (depending on how big they've set their pane) BEFORE they click to open. Worst-case scenario is they dislike what they see so much they never get as far as opening the email. The best-case scenario is they are enticed or inspired by the preview, and when they open the email they are fully engaged with its contents. So, as with so many media in the web 2.0 age, the important thing here is to hit the ground running. No long intros, no scene setting - just useful, headline information right at the top. It's using the journalism model, rather than the academic paper model - put your conclusions at the start. Are there any useful email tools I should know about? I think MailChimp looks great for non-profits. You'd probably need to use the paid-for version, but if email is an important part of your marketing strategy, and you can afford it, then MailChimp is worth it because of the level of control, and of impact measurement, it gives you. I'm a big fan of Scribd (as a creator rather than a consumer - don't be put off by its homepage which is aimed at the latter!) - it takes PDFs and turns them into web documents. So if your email newsletter is a PDF, I cannot stress enough how people don't click on and open PDFs nearly as much as we'd hope they do, so put in a link to a Scribd version (or embed it in the email if that's possible with the tools you use). Not only does this make the newsletter more easily accessible, it allows it to be discovered on the web, and it gives you built-in usage statistics for how it much it's being read too. Email feels very old-school sometimes, and it's tempting to think it's no longer relevant. But actually for a lot of Libraries and other non-profits email remains an essential tool for good communication, and if you think about it it's easy to see why. You have mass coverage (not EVERYONE uses email but a huge percentage do, and it's not a tribal medium like social media where people pick and choose to be on some platforms and not others); you have a captive audience (once they've given you permission to email them); the message goes directly to your audience; it waits for your audience until they're ready to see it (unlike asychronous media such as Twitter for example); and it's very easy for people to ACT on an email, by clicking a link within it. Where Email falls down is in sharability (it's much less intuitive to share useful information contained within an email with one click, than it is to share information contained on a specific URL) and, like so many other forms of communication, over-saturation. We all get too many emails. They can easily become part of the White Noise. Over the years I've read a ton of advice and guidance about emailing, and a lot of it is either over-complicated or related directly to chasing leads and converting sales and all sorts of other things we don't need to do in the non-profit sector. In fact, for me, it comes down to just three things, and, as it happens, they call begin with T: emails must be Targeted, Timely and Titled. These three things really do matter - TO ME. Every audience is different, so while I'd advise you try to work by the Three Ts, you may find your users respond differently to mine. Certainly targeting is something which I find works very well for me - the response rate (people doing the things I'm asking them to in the email) increases massively if I subdivide my audience into smaller groups and customise the content somewhat. The stat above relates to the MoreBooks campaign at York, mentioned int the White Noise presentation (slides 47 - 52, as displayed here). The title is so important - it makes the difference Open and Delete Unread on so many occasions (think about your own policy of reading emails from organisations). The stat there comes from convinceandconvert. In the past I didn't think being Timely mattered - the idea of sending an email at 3pm because that's the 'best' time to send it seemed mildly absurd to me. But I've changed my views on this - what is beyond doubt is that people are more likely to engage with an email if it comes with some distance either side of it, than they are if it comes with 10 other emails at the same time. You don't want to be part of a virtual pile, you want undivided attention. 3pm being the best time to send is a stat you hear everywhere, but in this particular case I got it from the sherpablog. There's another dimension to being Timely, around when to send emails in general (rather than the specific time of day), which will be covered in part 2 of this post later in the week. When I was promoting LISNPN, the New Professionals Network (check out their ace new site, by the way) I kept stats on which promotional avenues resulted in the most people signing up for the site. Email won every time. Articles in the professional press, newsletters, face to face presentations - these all helped, but ultimately people need to CLICK on something right away after they hear about it, or most of them will soon forget it entirely. Email allows you to put in a call to action which people can heed there and then. Marketing Libraries: What the not-for-profits can learn from the lots-of-profits! 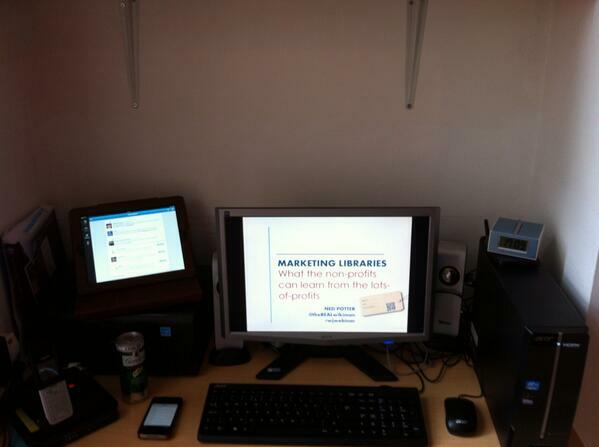 A couple of weeks ago I presented a webinar for WebJunction on marketing libraries. Part 1 of this post is all the information from the presentation, including a video archive of it, and Part 2 is about the process of presenting in a webinar, for anyone interested in that side of things. The webinar covered marketing principles (several ways to start thinking like a library marketer) - and marketing actions (ways to communicate including Word of Mouth, the website, social media etc). There are various ways you can access the content. Here are the slides, with a couple of bits of info added in so they make sense without me talking over the top of them. You can view the full Archive (combined archive of audio, chat, and slides) - this requires JAVA and is a bit more technically complicated than the options above and below, but you get the full experience of the slides, me narrating them in real time, and the chat happening in real time, where you'll find lots of good ideas. When I get a bit of time I'm going to break this down into smaller videos on each topic. Presenting a webinar is an inherently odd experience because you can't see the faces and responses of your audience. I rely on this a lot to know what is working and what isn't - a presentation is all about communication, after all. Not only that but it's a much bigger audience than for a normal talk - there was nearly 600 people watching this as it happened. Above is what my desk looked like - iPad to monitor tweetstream (which I didn't have the wherewithall to actually do), landline phone to speak into (I had it pressed against my ear for the first half hour before realising there was nothing to actually hear), G&T to drink (later decanted into a glass with ice, don't worry), iPhone to live-tweet pre-written draft tweets from (it was too stressful to do this well, so I sort of tweeted them in clumsy groups), PC to present from and clock to keep to time by. I asked for some advice on Twitter about what makes a good webinar - much of it was about good presenting generally, but the web-specific stuff centered around making it as interactive as possible (the technology limited how much I could do this, but I tried...) and giving people time to catch up (I think I pretty much failed to do this). Very useful advice from Jennifer at Web Junction included not putting any animations on the slides because these don't render well in the webinar environment (if I wanted stuff to appear on a slide as I went along, I made two versions of the slide and moved between them). The particular platform we used meant I had to dial in with a phone - a PHONE! - and talk into that whilst manipulating the slides, that was very strange. I had a practice run the night before and I'm glad I did - in essence I found out I just cannot present sitting down, I need the energy that comes from pacing around, so I ended up using my slide-clicker so I could wonder about my house without having to be too close to the PC... The downside to this is I couldn't monitor the chat nearly as well as I wanted to, to respond to questions, because I often wasn't close enough to read the small text. I enjoyed this whole thing, and clearly live-streaming and web-based events are going to be more and more important. They're very convenient for attendees, less so for presenters (I had to banish my family upstairs for example!) but I did get to wear shorts for a presentation for the first time, and even drink Gin & Tonic during it, and that was ace.